The first week of the 2018 Idaho Legislative Session is in the books. The important Stand-Your-Ground legislation that is being sponsored by Rep. Christy Zito (R-23) has been drafted and submitted to Legislative Services to be put into “bill” form. Next week we anticipate the intensity of the session will kick into full gear, and we’ll begin a hard fought battle for stronger gun rights in Idaho! 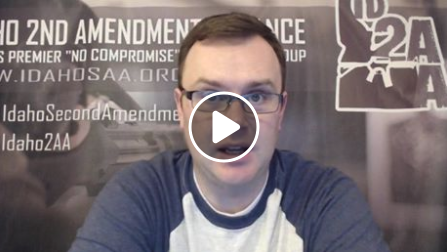 In the meantime, check out this video recap of Week 1 from Idaho Second Amendment Alliance President Greg Pruett! >>> What changes do we want for Stand-Your-Ground and Constitutional Carry? In the video, Greg mentions tickets for the ISAA 2nd Amendment Gubernatorial forum. You can get those free tickets here. Tickets are going quickly so don’t wait a moment longer! As we prepare to get into the thick of the session, don’t forget that none of this is possible without you. We will not pass Stand-Your-Ground without the support of Idaho’s gun owners standing with us. Please considering joining the Idaho Second Amendment Alliance today and help us mobilize gun owners across Idaho. If you recently joined the Idaho Second Amendment Alliance, then please consider another small donation of $25 or even just $10 to help us more gun owners during the session! Thank you for watching this crucial update and for your continued support of the only “no compromise” gun rights group in Idaho.